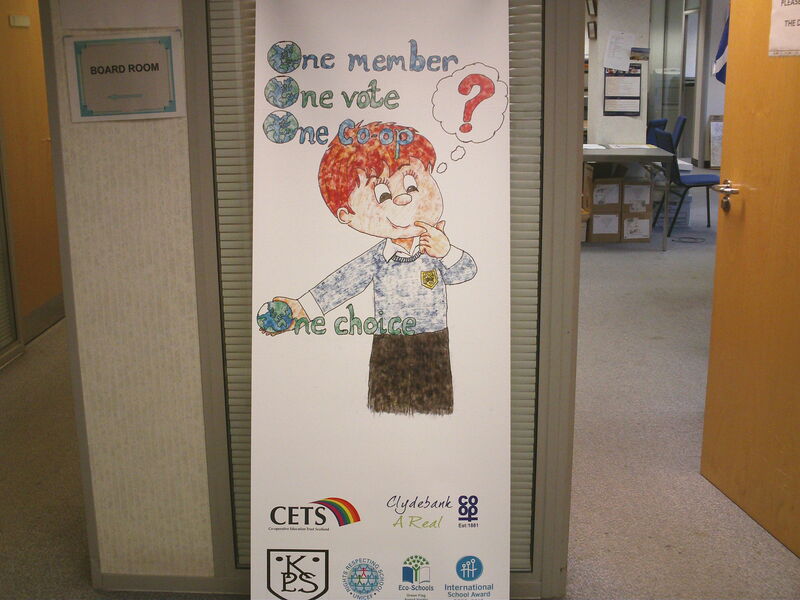 CETS and the Clydebank Co-op have been working in partnership with Kilbowie Primary to look at the Co-operative Values and Principles and put them into child friendly language. The resulting pop-ups and poster will be displayed in Kilbowie Primary and Clydebank Co-op, to promote understanding of the benefits of the co-operative business model and encourage people to join their local co-op. A secondary-school in Ayrshire working towards becoming a ‘co-operative school’ (see Peter Flood’s presentation below). We made some attempt to organise the chaos: pupils were assigned workshops depending on their age, and the adults in attendance were treated to a series of interesting, informative (and occasionally controversial!) talks. This ensured that there was ‘something for everyone’ at the event and kept the wee (and not so wee) ones engaged throughout the day. Ashley Simpson, Reddish Vale Co-operative Graduate also spoke of his experience of attending the UK’s first co-operative trust school. Our sincere thanks to all who attended and supported the event (especially the volunteers from Robert Owen House in Glasgow) and, after a well-deserved break, we’ll have an eye on next year soon enough. (There are some photographs of the event that can be viewed on our Flickr account; if anybody who attended has some pictures that they wish to share then please email us at info@cets.coop). The United Nations has declared 2012 to be the International Year of Co-operatives in recognition of the impact that co-operative enterprise has on more than three billion people across the globe. Co-operatives contribute to national and local economies in virtually every country by championing an ethical approach to business underpinned by internationally agreed values and principles. Yet despite the wide-ranging successes of co-operatives, in financial terms as well as in the development of sustainable communities, the study of these democratic forms of enterprise remains surprisingly absent from the curricula of most university business schools around the world. Designed primarily for undergraduate students, Democratic Enterprise provides an introductory-level analysis of democratic models of enterprise, namely cooperatives and employee-owned businesses. A supplement to any course that deals with these topics, it also stands alone as a template for academics who wish to incorporate material on democratic models of enterprise into courses relating to economics, business studies, sustainable development, enterprise, and organisational theory and behaviour. With our new primary resource and the approval of SQA qualifications in Co-operative Studies, we have provided a pathway or educational journey for students interested in co-operatives, one that starts in the Curriculum for Excellence and culminates in higher education. Do you know how to set up and run a successful Fairtrade Café? If not, but you would like to, get in touch with the P6 class at Carlogie Primary in Carnoustie and they will be delighted to help you! Over the last few months they have been planning the opening of their monthly fairtrade café. 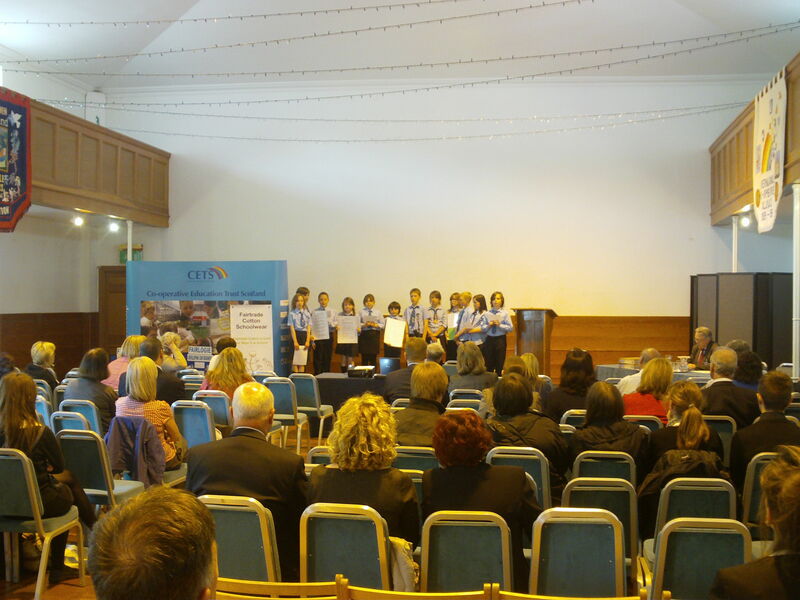 The first very successful morning was held on the 23rd November, in the local church hall. I arrived to be greeted and escorted around by a group of very enthusiastic and knowledgeable young people who delivered me into the capable hands of tea and coffee makers, who then engaged me in conversation around the merits of their fairtrade products. They were unfazed by doing mental calculation to give me my change after I had been persuaded to buy other attractive fairtrade products from another stall! Their easy, relaxed and informed manner created a warm happy atmosphere for all their customers – I counted at least 60 –who arrived from all over their community to support them. Asking the minister to announce their enterprise from his pulpit on the preceding Sunday was obviously also a very good marketing ploy! At the co-op, we are always trying to explain clearly what our values and principles are – looking at the student’s interpretation of them, perhaps we can learn how to apply them more easily through children’s eyes. I also have to mention, for teachers benefit, that to my mind this is a really good example of how to “do” Curriculum for Excellence. There was evidence of true interdisciplinary learning – listening and talking, writing, numeracy, health and well-being for starters, as well as showing how to put the four capacities into action. If you want to see this all happening for yourself – go along to their next Fairtade Café event at Panbride Church Hall, Newton Church, Arbroath Road, Carnoustie, 10am-11.30 on Wednesday 14th December. Remember to take plenty of cash as their excellent sales team will persuade you to buy lots of their excellent products specially selected for Christmas. There – they have now managed to get me to do some marketing for them as well!